While he was in Paris, Vincent discovered new pigments that were being produced in Europe in the late 19th Century. These new pigments were much more vibrant, pure, homogeneous and with a brightness superior to the old ones. 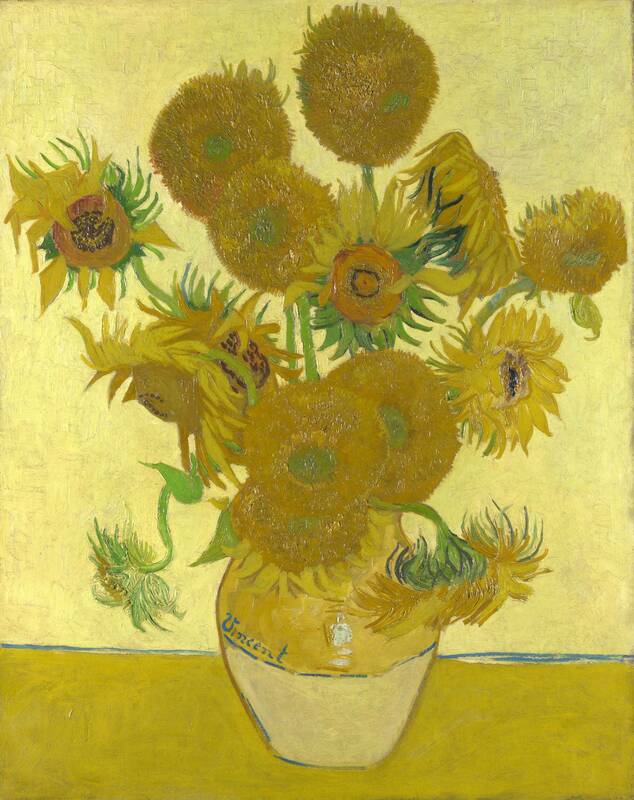 Vincent became obsessed with the color chrome yellow, which made possible all the sunflowers. After spending a year in Paris, Vincent decides to move to southern France, to a rural town called Arles. He made this decision because Paris was always cloudy and Arles, on the coast of the Mediterranean, always had sunny days. Vincent himself will tell his brother that he moved south to search for sunlight which will vivify his palette. Imagine that, if there was one place distant from the art circle of that time, it would be Arles. The driven artist, shocked by the yellow color of the façade of a house, decides to rent it. The locals didn’t take long to nickname the artist as the “crazy redhead”. Settled and alone in the yellow house, Vincent’s illness worsened. Delusional, he wants to create a community of artists who would live like monks, and would devote themselves exclusively to art. This community would have a master and his 12 disciples. His admiration for the artist Paul Gauguin makes Vincent to think of him to become the master and he invites him to spend a season in Arles. Gauguin, at that time, was broke; so he accepted the invitation as a way to have a cheap place to stay for some time. A few months back, Gauguin had praised Vincent’s Parisian sunflowers, so our artist, in front of the expectation of the master’s arrival, anxiously returns to painting sunflowers, with the aim of decorating the different walls of the rooms in the yellow house. That’s when he painted the version of the Sunflowers we are reviewing. Gauguin arrives to town a few months later. The artists devote themselves to painting and discussed about art throughout the whole day. In no time, both realized that their personalities and thoughts on art were radically different. Discussions, then, became arguments. Suddenly, it started to rain and Vincent and Gauguin found themselves locked in a house fighting all day long. The harmonious project of the community of artists faded as quickly as it was born. The arguments became fights and, after one of them, Vincent suffered a breakdown and cut the lobe of one of his ears. Until here, I wanted to picture the context in which Vincent painted the Sunflowers. In the next post, we’ll take a look at the symbolism of the painting. ~ by Álvaro Mazzino on February 2, 2011. The power button is now located on the right side of the phone instead of on top; it’s much more reachable, but it’s also really easy to confuse with the volume-down key, which is basically the same button positioned one inch higher. This entry was posted on February 2, 2011 at 10:39 and is filed under Expresionism.You can follow any responses to this entry through the RSS 2.0 feed.You can leave a response, or trackback from your own site.